First things first: we're sorry. As a result of a malfunction in Windows Azure, many participants in our Community Technology Preview (CTP) experienced degraded service or downtime. Windows Azure storage was unaffected. In the rest of this post, I'd like to explain what went wrong, who was affected, and what corrections we're making. During a routine operating system upgrade on Friday (March 13th), the deployment service within Windows Azure began to slow down due to networking issues. This caused a large number of servers to time out and fail. Once these servers failed, our monitoring system alerted the team. At the same time, the Fabric Controller automatically initiated steps to recover affected applications by moving them to different servers. The Fabric Controller is designed to be very cautious about taking broad recovery steps, so it began recovery a few applications at a time. Because this serial process was taking much too long, we decided to pursue a parallel update process, which successfully restored all applications. Any application running only a single instance went down when its server went down. Very few applications running multiple instances went down, although some were degraded due to one instance being down. In addition, the ability to perform management tasks from the web portal appeared unavailable for many applications due to the Fabric Controller being backed up with work during the serialized recovery process. We have learned a lot from this experience. We are addressing the network issues and we will be refining and tuning our recovery algorithm to ensure that it can handle malfunctions quickly and gracefully. 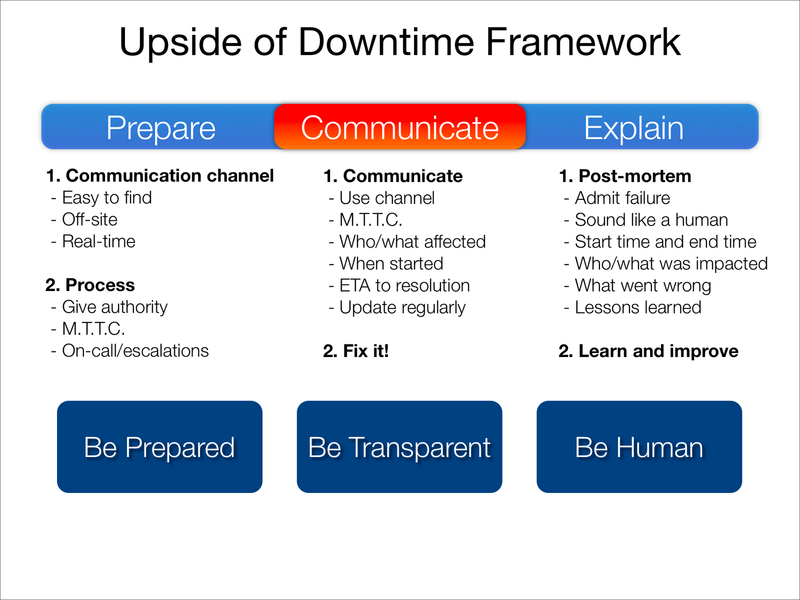 This is a solid template to use in coming clean about your own downtime events. Apologize (in a human, non-boilerplate way), explain what happened, who was affected, and what is being done to prevent this in the future. Well done Microsoft. is not so easy for all but we have a great way to maintain pain.